I’ve known N+T’s Founder and Executive Director, Kate Gilbert since our days together as graduate students at the School of the Museum of Fine Arts. During our graduate student years, it struck me that Kate had a vision beyond being a studio artist: she had a passion for public art and, at the time, she was managing the Rose Kennedy Greenway Conservancy's public art strategy and planning. Fast forward to early 2018. I was working as the Arts Program Coordinator for the Villa Victoria Center for the Arts. when we received an invitation from Now and There to collaborate in building Stephanie Cardon’s public art project UNLESS. The Villa Victoria Center for the arts is part of Inquilinos Boricuas en Acción (IBA), one of Boston’s most dynamic community development organizations. IBA is a Latin-led organization, a historic landmark in the South End of Boston, and an example of a successful grassroots organization. In the 60’s the largely Puerto Rican population that lived in the South End of Boston was being forced out of their rundown neighborhood by urban renewal plans. In the face of eviction, the residents of Parcel 19 stood together, refusing to move, but also presenting a proposal of what they envisioned for their community and their future. With the hard-earned support of city representatives and the invaluable partnership of architects, the South End Parcel 19 residents planned an affordable housing project, Villa Victoria, that would suit their needs while improving and beautifying the area. The project was approved and implemented, and fifty years later IBA and the Villa Victoria community is still thriving in Boston’s South End. 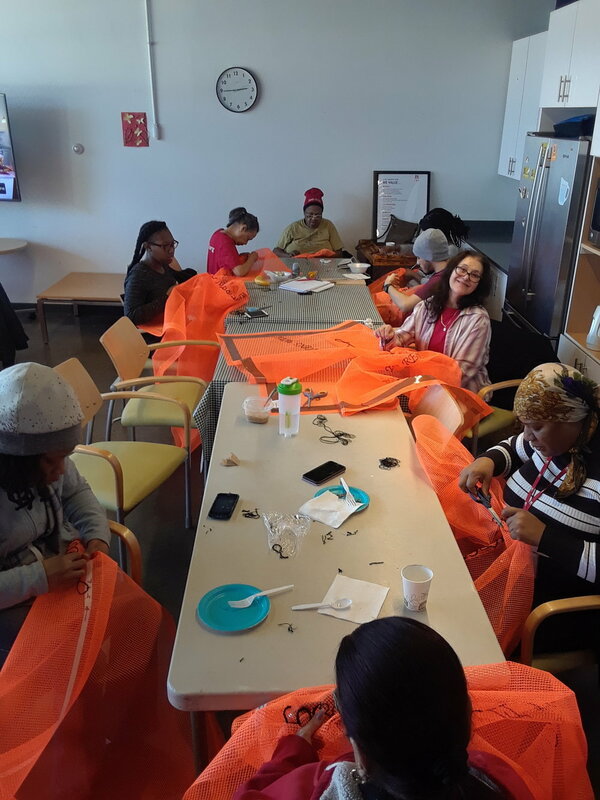 The organization has grown to implement a Financial Empowerment Program, the Villa Victoria Center for the Arts, a Youth Program, a Preschool, a partnership with Bunker Hill Community college, as well as offering residents legal advice and a lively, tight-knit community. In early 2018 Now and There approached us with the desire to engage the Villa Victoria Community in creating a large scale public installation piece discussing climate justice, offering compensation to Villa Victoria residents who wished to join artist Stephanie Cardon in building the piece. She was particularly interested in working with people directly affected by climate change. Cardon’s project spoke directly to IBA’s mission. Photos taken by artist Stephanie Cardon during the production of UNLESS. 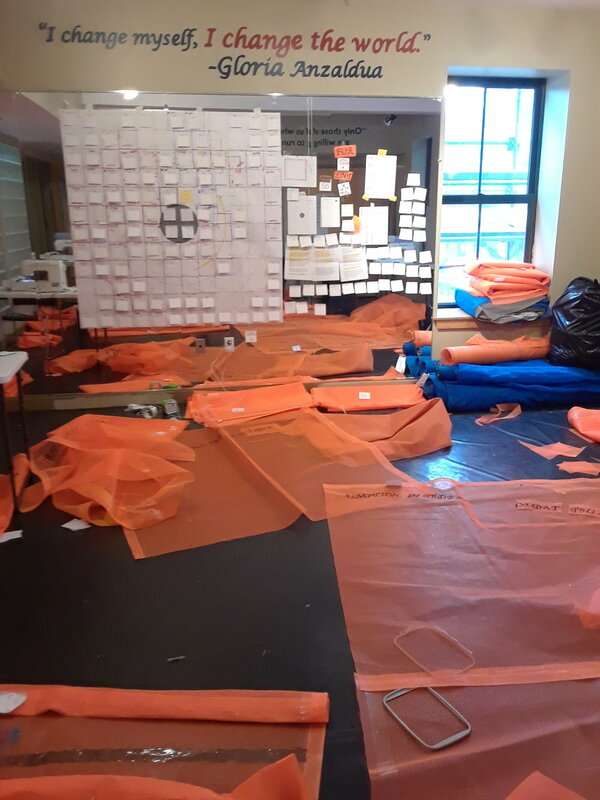 Left: Debris netting and plotting charts take over studio space at the Villa Victoria Center for the Arts. Right: A Massachusetts College of Art student assistant pieces together the net tapestry in the main events space at Villa Victoria. In September 2017, Puerto Rico experienced the traumatizing devastation of Hurricane Maria. Many of Villa Victoria’s residents have family members living on the Island who suffered losses or were displaced by the storm. The effects of Maria are still being felt in Puerto Rico one year after landfall, with power outages and limited access to clean water in some regions. Today the island is still grappling with the fallout, as the death toll continues to rise in connection to precarious conditions resulting from this unprecedented storm (many estimates put the loss of life above 4,500). But, perhaps most problematic, is the continuous exodus from the island in the aftermath of Maria. These mass migration patterns are part of an increasingly familiar, yet largely ignored phenomenon, that of climate refugeeism. As an organization, IBA is well aware that it is not enough to denounce the issues of our time, it is necessary to engage communities and grassroots movements in order to effect change and search for solutions collectively. Climate change is a challenge much larger than any one particular social group, although its effects will be felt with much greater force by vulnerable populations, making Cardon’s collaboration with Villa Victoria residents even more pertinent. If we are not able to engage and educate the people that are and will continue to be directly affected by climate change, then solutions may be out of reach. It is important that the populations that suffer the most due to climate change are able to organize and demand contingency plans, and that they are allowed to gain representation through voting and dialogue with government agencies and elected officials. Without community organizing, critical thinking, and public debate, we might not be able to act in time to prevent the increasing long-term effects of the climate crisis. Members of the IBA community come together to help stitch and embroider the main tapestry of UNLESS. It is not easy to promote engagement. Apathy is a common reaction to overwhelming duress and it can only be overcome by a sense of agency and ownership which call hearts and minds to action. Stephanie was very invested in having the construction of her project be a community affair, providing opportunities for Villa Victoria residents to come together and get to know the project. She formed genuine relationships with participants while being respectful of the level of involvement each person was able or willing to provide. Her project offered a creative outlet and a reflection on the bigger picture, rekindling the spirit of community organizing that led to the creation of IBA. Problems that are created collectively demand solutions within a collective mindset. Thank you to Now and There and artist Stephanie Cardon for understanding the importance of community engagement and fostering a collaborative mindset within Villa Victoria’s community. We look forward to seeing this project as well as many others come to life in the city of Boston. Julia Cseko is an artist and curator, born in Colorado and raised in Rio de Janeiro, Brazil. For the past year she has been implementing an exhibitions program at IBA’s Villa Victoria Center for the Arts, showcasing contemporary art by artists of Latin American origin/heritage, including artists working within Latin American subjects and aesthetics. Her work as an independent curator and organizer is centered on diversity, inclusion, community building, innovation, political engagement, experimentation and risk-taking. Also a practicing contemporary artist, in May 2018 she was invited to attend the MASS MoCA artist residency program. Her artwork is featured in collections including the University of British Columbia, Vancouver, Canada; the Museum of Modern Art in Rio de Janeiro and Centro Cultural São Paulo, Brazil, as well as private collections in the United States and abroad.